Kevin Bacon and Fred Ward star as two country handymen who lead a cast of zany characters to safety in this exciting sci-fi creature comedy. Just as Val McKee (Bacon) and Earl Basset (Ward) decide to leave Perfection, Nevada, strange rumblings prevent their departure. With the help of a shapely seismology student (Finn Carter), they discover their desolate town is infested with gigantic man-eating creatures that live below the ground. The race is one to overcome these slimy subterraneans and find a way to higher ground , in this enjoyable thriller co-starring Michael Gross and Reba McEntire. 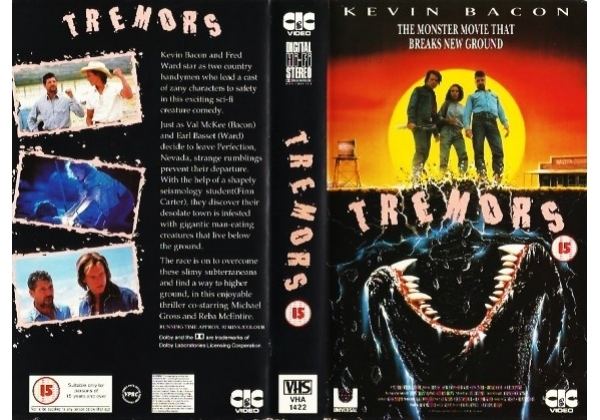 Or find "Tremors" on VHS and DVD / BluRay at Amazon.